Most major banks charge you fees just to maintain a checking account every month. These fees are advertised as “low,” but are generally in the $3-$12 per month range. Let’s go right down the middle and say you pay $7/month. That’s $84 a year. It doesn’t sound like a ton of money, but when you consider you’re paying it to the bank just to hold your money, the ethics of the situation are maddening. Want to avoid this assault on your hard-earned cash? Try one of the options below. Credit unions are a fantastic alternative to banks. 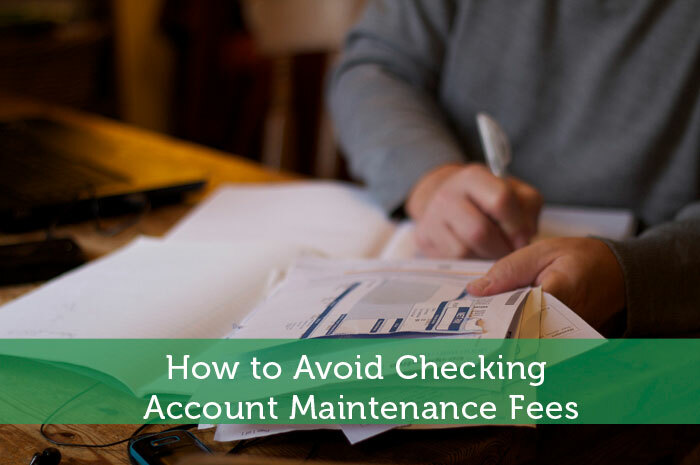 Seventy-two percent of their checking accounts come with no monthly maintenance fees, and their interest rates are dramatically more in favor of the consumer. You can typically earn a much higher interest rate on your checking and savings accounts by using a credit union, and the interest that you pay on products such as loans, mortgages, and credit cards are usually lower. Many banks will advertise that they have free checking accounts, but when you read the fine print next to that asterisk at the bottom of the ad you’ll find that there are many conditions that must be met in order to have totally free checking. The biggest conditions to look out for are minimum balance requirements (which mandate that you keep a certain amount in your account or you’ll be charged a fee,) direct deposit waivers (that allow you to avoid fees if you have a large enough paycheck set up to direct deposit to your account every payday,) and waivers for having a linked account with the same institution (such as a savings account or mortgage.) If you don’t fall into any of those categories, know that your “free” checking account may not be so free. You’ll still end up paying the monthly maintenance fee. If neither of the above options work for you, look at other banks. There are banks out there that charge no monthly maintenance fees with no asterisks. You just probably won’t find them on a list of institutions holding the most assets. Some of them will still have the asterisks, but the minimum balance requirement or the amount to qualify for a direct deposit waiver will be lower, allowing you to bank with them for free, anyways. Look at “smaller” banks, and you’ll be more likely to find something that’s a better fit. It’s Your Money. Hold Onto It. Eighty-four dollars doesn’t sound like a lot. But you worked hard for those $84. If you’re making $40 per hour, you worked just over two hours last year for the privilege of banking at an institution that charges checking account maintenance fees, and that’s if they only charge $7/month. The next time you go into work, for those first two hours really think about the fact that everything you’re doing is to make a banking institution richer, rather than yourself. Then go do some shopping that will actually keep your money in your bank account, where it belongs. Femme Frugality is a personal finance freelance writer. You can read more of her work on her blog, or connect with her on Twitter, Pinterest, or . Thanks for the tips! I’ve just graduated from high school, so now I need my own checking account to help me manage my money. My parents told me about how opening a checking account often means paying fees just to manage it. I liked your point about signing up with a credit union to avoid checking account fees. So, why is it that only 72% of the checking accounts at credit unions come with no monthly maintenance fee? It seems like all of their customers should have a checking account that they don’t have to be charged just to manage. Really? That is the amount the bank is taking out from my account. If that is the case, I should have to consider credit union. Thanks for this information. Thanks for these careful foresights. Great share Femme… It is completely right. It’s our money and why we are giving it for the just checking the account. I thought that the points given by you are really useful for anybody who are wasting their money. If it was a more realistic option for me, I’d just put all my money underneath a mattress at home. Seriously though, I’ll consider using a credit union instead. Every time I look a pamphlet for a checking account for bank, there are tons of asterisks every where. Thanks for the helpful tips to keep an eye out for hidden costs. I was just talking to my wife about this the other day. I currently use a large bank for my checking account I have meet certain qualifications in order for it to be free. We are probably going to switch to a new account and I like your tips. I will check out banks or credit unions that don’t have an asterisk next to “free checking account”. thanks! You make a great point that you should look at other banks. My brother is always talking about how his bank charges him for all sorts of stuff every year and he doesn’t know why. My bank doesn’t charge anything crazy, but I’ll have to tell my brother to start shopping around or come to my bank!